Sorry, but other life commitments have pulled me away from being able to host this meme. I never thought I would be away from it this long, but it has been long enough for me to realize I couldn't keep up with this activity anymore. Thanks for checking in. Visit Daily Meme to see other memes you can participate in by the days. 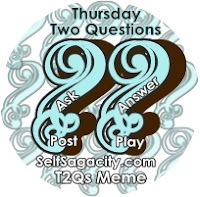 Welcome to Thursday Two Questions Meme! Linky available every Wednesday at 4:30 PM PST. Have you ever had a question about something silly or smart? Or just curious about how people think and what people did about it? Thursday Two Questions Meme will give you a chance to get your answers, comments, or suggestions from your very own loyal readers. Thursday Two Questions is geared towards helping you build quality comments, content, and page bounce rate. The key is to have fun and none of it matters, but the quality comments will certainly contribute to better content for your blog and help with your figure out how to improve Google Page Rank and Alexa Traffic Rank. * Any form of questions: picture, poem, or story. Make your questions obvious. * Anything goes, be creative. * NO stress, no expectations to be perfect, simply two questions. * We encourage you to visit other participants and try to answer their questions if you don't know the answer - just leave them a comment. * Link back to Self Sagacity so that others know where to participate. It is fine if you link along with other memes, just as long as you have your two questions. I am excited to see what questions you have. Anytime you need more information, please feel free to send us an email.